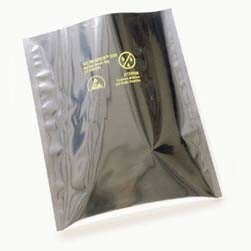 These semi-transparent, metalized static shielding bags provide a static safe environment for sensitive electronic devices. Faraday cage effect of the metalized layer shields electronic devices from ESD and electrostatic fields. Bags are printed with ESD warning symbol and date coded for QC traceability. Tested to meet or exceed MIL-B-81705C Type III, EIA 541, EIA 625, MIL-HDBK-263, MIL-STD-1686 and EOS/ESD Standards.